Is Charter School Bubble About to Burst? Their shaky financing is causing failures locally, nationally. Yet Trump wants more. Lee School. Photo from Facebook. 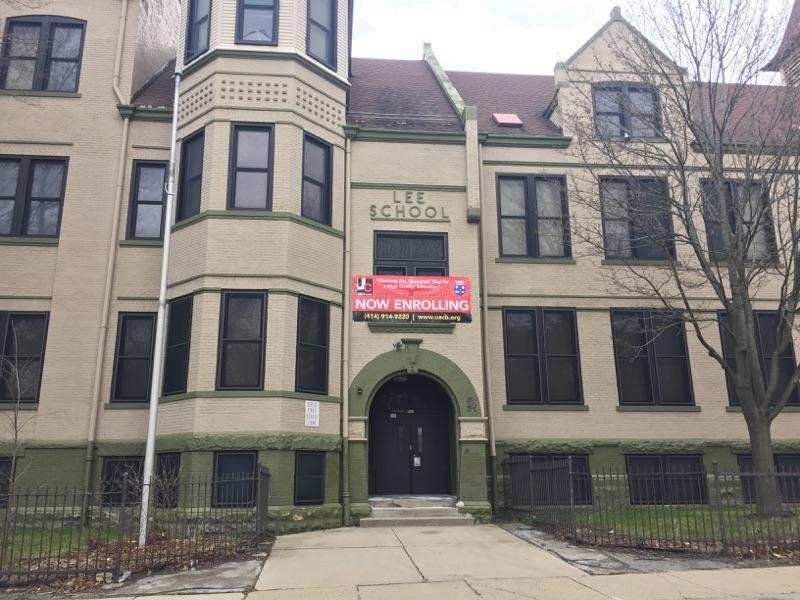 Universal Academy recently informed Milwaukee Public Schools it could no longer financially support its three Milwaukee schools due to a lack of enrollment. Both Universal and MPS agreed to allow Universal to continue operating at a single site, the previous Webster building, while two other sites, Green Bay and Lee, would be returned to MPS. MPS officials believe Universal has attempted to be a good partner with the district. However, while Universal may have made a few mistakes, it could be a victim of a bursting charter school bubble that is beginning to appear across the nation. That problem was described by UW-Madison Prof. Julie F. Mead and has become all the more important since incoming President Donald Trump has signaled a desire to increase the use of charter and voucher schools in America. Mead is a co-author of “Are We Heading Toward a Charter School ‘Bubble’? Lessons from the Subprime Mortgage Crisis,” an article in the February 2016 issue of University of Richmond Law Review. Their work is a follow up to a similar contention made in a blog post in July 2014 by Prof. Mark Naison, Fordham University in New York. According to Mead and others, the subprime mortgage crisis began with some laudable goals of extending home ownership to as many individuals as possible. In exchange for little or no down payment, new home owners could obtain a mortgage with a ballooning interest rate that would kick in after a couple of years. The thought was, as they became homeowners, their lives would be more stable, their incomes might rise, and even if they had trouble meeting the rising interest rates, they could always sell the homes at ever increasing prices. But that is not how it worked out. Instead, many homeowners couldn’t make the mortgage payments, so fewer people could buy homes, home values crashed, and America found itself in the worst economic crisis since the Great Depression. According to Mead and others, charter schools may be headed in the same direction. Chartering organizations rushed in to take advantage of the charters being handed out by state legislatures, school districts, and other organizations. And just as the housing mortgage crisis was fueled by a building boom resulting in overcapacity, too many charters were created with too many seats. That is one of the problems Universal faced here. And like the homeowners who bought houses with little down payments and no money in the bank, many charter school management companies have little leeway in their cash flow if the number of students just are not there. They can’t weather the storm if problems develop at one or two schools. Back in Philadelphia, Universal may be losing three of its eight schools due to poor performance. Universal is not alone in these problems. Consider the story of American Quality Schools of Chicago. In 2012, AQS was approved for a charter with the city of Milwaukee and was seeking another with MPS. I opposed the charter and convinced the majority of the MPS board to deny the charter, incurring the wrath of several board members. It is fortunate that we said no to AQS. When AQS first applied to MPS it was running or in the processing of running about a dozen schools from St. Louis to Fort Wayne, Indiana. But many of its charters were in trouble, and they were losing much of their portfolio. Today AQS has only two schools left; the rest have either closed or the chartering agency pulled its management away from AQS. The school authorized by the city of Milwaukee? It never opened. In most cases, AQS never held the charters directly, but was only contracted as a Charter Management Organization (CMO) to run the school. That is still the case of its school in Fort Wayne. The Urban League holds the charter and contracts management with AQS. CMOs, says Mead, “are the most similar to the subprime mortgage problem.” Moving from the chartering organization to the charter holder to a CMO is like the bank issuing a mortgage and then bundling mortgages to sell on the open market. Like the bank ridding itself of the liability of the mortgage, chartering organizations are removed from the liability of the CMO to operate in a fiscally responsible manner and provide a quality education. In the charter modification with Universal, MPS is exercising greater day-to-day financial oversight. Mead believes that state laws should require total financial transparency of all contracts. This is especially a problem with for-profit CMOs who believe they have little or no obligation to have open books as a private company. Last year AQS tried to open a charter school in Kalamazoo, Michigan, but did not find enough interest to continue the process. It also attempted to open a private school, tuition based, in the higher income community of Batavia, just west of Chicago. It too attracted little interest and the project was abandoned. Now AQS is in China, trying to recruit students, offering the services to help them attend schools and universities in the United States – a long way away from AQS original mission. There are a whole string of other major charter school players that have fallen on hard times. This is especially true for for-profit charter companies says Jessica Huseman in a 2012 Slate article. EdisonLearning was once the largest for-profit charter manager in the country, in control of 130 schools across 22 states. By 2012, it managed only five schools. Large corporate models running charter schools across state lines in districts with various rules and reporting requirements makes it almost impossible for large charter companies to compete successfully. Yet we may see a push for more such charters under President Trump. Terry Falk serves as a member of the Milwaukee School Board. This analysis describes some inescapable factors when private charter and voucher schools compete for students and public funding. Creating an Educational Industrial Complex has resulted in many entrepreneurs–with varying motives–chasing Almighty Taxpayer Dollars. What happens to enrolled students when charters abruptly close up shop? AQS does not own the building in Fort Wayne. So it’s not an example of a school with real estate debt that could go bust. The whole scam of voucher/charter schools with taxpayers paying for these private businesses should be exposed. This comparison is completely incongruous. The capacity of charter/voucher schools is easily measured and controlled by the chartering organizations (for charter schools) and the state legislature (for voucher schools). They can see if there is demand or not and can approve additional space as needed based on the number of parents that wish to send their children to those schools. Is there some data showing that there are too few students to fill the charter/voucher schools in Milwaukee? Sounds like Universal had other issues besides enrollment. Meanwhile, the well performing charter and voucher schools have long wait lists. I actually mentioned College Prep in my original article I submitted to Bruce Murphy. I’m not upset that he cut it. The article was fairly long, and one cannot say everything in a few hundred words. Just like in the housing boom/bust, not everyone who went out and got a mortgage overextended their credit, but everyone got hurt by the bad housing policies around them. Even good charter schools are going to get hurt if there are few controls in the chartering process. I’m not even saying that Universal is a bad charter. I’m just saying we can’t have a total free market, dog-eat-dog, chartering system. When charters close, children get hurt.